In New Zealand, empiric treatment with omeprazole for infant irritability and reflux is increasing, despite the fact that it is not approved for this condition, is unlikely to improve symptoms and the potential adverse effects are largely unknown. Omeprazole should only be considered for infants in cases of gastro-oesophageal reflux disease (GORD) associated with severe reflux oesophagitis or failure to thrive. Crying and irritability: a normal part of infancy or a pathological cause? The phrase “sleeping like a baby” is intended to mean peaceful sleep, however, the reality is that babies frequently wake, cry and require feeding. Although much variation occurs, crying generally increases at age two weeks before peaking at age six to eight weeks while a diurnal sleep/wake cycle is established.1 Some infants will display excessive crying and irritability which may cause parental anxiety � particularly for first time parents. Sometimes parents suspect a pathological reason for their infant’s distress with up to 20% of parents reporting a problem with infant crying or irritability in the first three months of parenthood.2 However, in most cases, no medical intervention is required. “Reflux” is commonly blamed for infant irritability, however, this is a normal occurrence in an infant and generally does not require medical treatment. Parents can be provided with reassurance and practical advice for managing the symptoms (below). Uncomplicated reflux is a normal process involving the involuntary passage of gastric contents into the oesophagus. This occurs asymptomatically throughout the day, and may involve movement of food, drink and saliva, as well as gastric, pancreatic and biliary secretions. Reflux is less acidic in infants than in older children and adults, as the stomach contents are buffered by the frequent consumption of milk. Regurgitation is the appearance of refluxed material in the mouth. Approximately 40% of infants regurgitate at least once a day.4 In most cases, regurgitation resolves over time without treatment. Barium swallow: This procedure excludes structural abnormalities such as hiatus hernia, oesophageal atresia, tracheosophageal fistula and malrotation of the upper GI tract. Through imaging the oesophagus, it is possible to observe reflux and in some cases confirm or exclude oesophagitis or dysmotility. The limitation of this technique is that imaging is only possible for approximately five minutes therefore episodes of reflux may be missed. Endoscopy and oesophageal biopsy: Used infrequently, these procedures are useful for diagnosing oesophagitis, but cannot detect mild reflux. They are considered when there is pain and irritability associated with an uncertain diagnosis, a poor response to treatment or GI blood loss. Failure to thrive is an inability to gain weight in comparison to height. The infant may continue to grow but with reduced weight gain secondary to reduced caloric intake. Poor weight gain requires evaluation of caloric intake and ability to swallow. Failure to thrive is associated with multiple underlying conditions, including GORD. As many of these syndromes have overlapping symptoms, diagnosis can be difficult. However, eczema and a family history of atopy increase the risk of CMPA. Complete elimination of cow’s milk from the diet (or the mothers diet if breast feeding) for two to three weeks and observing if symptoms resolve will usually confirm suspected cases. For further information see: “Allergy to cow’s milk protein and the appropriate use of infant formula”, Prescription Foods (May, 2011). Omeprazole is a common treatment for gastric reflux in adults, but it is not approved for use in infants aged under one year. The safety, pharmacokinetics and bioavailability of omeprazole in young children is largely unknown. How is omeprazole given to infants when required? An alternative preparation for infants involves sprinkling half the contents of a 10 mg capsule on a small quantity of apple or pear puree.20 However, it is difficult to achieve an accurate dose with this method and care needs to be taken that the infant is able to swallow the mixture safely. Omeprazole capsules and tablets should not be chewed, or dissolved in milk or carbonated water, as this can degrade the enteric coating. There are also suggestions that PPI use can cause rebound acid secretion resulting in PPI dependency. A study of 120 adults with no history of acid related symptoms, found that more than 40% of subjects developed such symptoms following an eight week course of PPI treatment.25 It is unknown if such an effect also occurs in infants. The absence of long-term data concerning the safety of PPIs in treating infants, combined with reports of serious adverse effects, regardless of frequency, suggests that PPIs should only be prescribed to infants when the benefit outweighs any potential risks. How much omeprazole is being prescribed to infants in New Zealand? Between 2006 and 2010, the number of prescriptions of omeprazole dispensed for infants aged under one year in New Zealand increased from 4650 to 8231. The largest increases occurred in the age zero to three months (111%) and four to six months (80%) cohorts. This increase is despite a lack of evidence to support the prescribing of omeprazole to infants for symptoms such as irritability and regurgitation associated with uncomplicated reflux. Omeprazole should only be considered in cases of severe infantile reflux oesophagitis or in cases of GORD accompanied with failure to thrive. Alginates such as a mixture of sodium alginate and magnesium alginate (Gaviscon infant) reduce acidity and reflux through increasing the viscosity of gastric contents. They can be used to relieve symptoms of regurgitation or reflux in infants. Alginates should not be used in infants at risk of dehydration (e.g. acute vomiting or diarrhoea) or intestinal blockage due to reports of constipation. Gaviscon infant powder is available in sachets. For infants weighing < 4.5 kg, use one sachet mixed into each feed, and two sachets for infants weighing > 4.5 kg.10 Infants should not be given this medicine more than six times in a 24 hour period. Unlike adult versions of the medicine, Gaviscon infant does not contain bicarbonate frothing agents or aluminium hydroxide. Granny told mother and mother told me...Is gripe water useful? Gripe water is a traditional remedy that is used by parents for infants with reflux, colic and various other ailments. Formulations may contain alcohol, bicarbonate, sucrose, ginger, dill, fennel and chamomile. There is no evidence that gripe water is clinically effective for any of the conditions it is claimed to relieve. If parents wish to trial gripe water for their infant, they should be advised to avoid formulations that contain alcohol or sugars. Blumenthal I. The gripe water story. J R Soc Med 2000;93:172-4. Histamine receptor antagonists such as ranitidine reduce histamine induced gastric acid and pepsin release. Ranitidine has been shown to be effective in the treatment of some cases of oesophagitis in children,27 and is associated with a low incidence of adverse effects. However, as with omeprazole, there is no evidence to support empiric treatment of infants with symptoms of irritability and reflux. In New Zealand, ranitidine is not registered for use in children aged under eight years and discussion with a paediatrician is recommended before prescribing this medicine to an infant. Ranitidine is available in a syrup formulation that can be administered to infants at a dose of 2 to 4 mg/kg, two times daily.10 N.B. ranitidine syrup contains 7.5% w/v ethanol. Thank you to Associate Professor David Reith, Paediatrics & Child Health, Dunedin School of Medicine, University of Otago, Dr Chris Leathart, General Practitioner, Christchurch and Dr Anna Alderton, General Practitioner and Clinical Facilitator, Pegasus Health for expert guidance in developing this article. Michelsson K, Rinne A, Paajanen S. Crying, feeding and sleeping patterns in 1 to 12-month-old infants. Child: care, health and development 1990;16:99-111. Hiscock H, Jordan B. Problem crying in infancy. Med J Aust 2004;181(9):507-12. Vandenplas Y, Hassall E. Mechanisms of gastroesophageal reflux and gastroesophageal reflux disease. J Pediatr Gastroenterol Nutr 2002;35(2):119-36. Orenstein SR. Infantile reflux: different from adult reflux. Am J Med 1997;103:114S-19S. North American Society for Pediatric Gastroenterology and Nutrition (NASPGN). Pediatric reflux clinical practice guidelines. J Pediatr Gastroenterol Nutr 2001;32(Suppl. 2):S1-S31. Heine R, Jordan B, Lubitz L, et al. Clinical predictors of pathological gastro-oesophageal reflux in infants with persistent distress. J Paediatr Child Health 2006;42(3):134-9. Orenstein S, Hassall E, Furmaga-Jablonska W, et al. Multicenter, double-blind, randomized, placebo-controlled trial assessing the efficacy and safety of proton pump inhibitor lansoprazole in infants with symptoms of gastroesophageal reflux disease. Pediatrics 2009;154(514-20). Finkel Y. Am I a heretic if I don't believe in GERD? J Pediatr Gastroenterol Nutr 2006;43:3-4. Fike F, Mortellaro V, Petitford J, et al. Diagnosis of gastroesophageal reflux disease in infants. Pediatr Surg Int 2011;27:791-7. Starship Children's Health. Gastro-oesophageal reflux 2007.Available from: www.starship.org.nz/clinical-guidelines/ (Accessed Oct, 2011). BMJ. Best Practice: Disorders of infant feeding 2011. Available from: www.bestpractice.bmj.com (Accessed Oct, 2011). Orenstein SR, McGowan JD. Efficacy of conservative therapy as taught in the primary care setting for symptoms suggesting infant gastroesophageal reflux. J Pediatr 2008;152(3):310-4. Kemp AS, Hill D, Allen K, et al. Guidelines for the use of infant formulas to treat cow's milk protein allergy; An Australian consensus panel opinion. Med J Aust 2008;188(2):109-12. Allen KJ, Davidson GP, Day AS, et al. Management of cow's milk protein allergy in infants and young children: An expert panel perspective. J Paediatr Child Health 2009;45:481-6. Moore D, Tao B, Lines D, et al. Double-blind placebo-controlled trial of omeprazole in irritable infants with gastroesophageal reflux. J Pediatr 2003;143:219-23. Omari T, Haslam R, Lundborg P, Davidson G. Effect of omeprazole on acid gastroesophagel reflux and gastric acidity in preterm infants with pathological acid reflux. J Pediatr Gastroenterol Nutr 2007;44(1):41-4. Van der Pol R, Smits M, van Wijk M, et al. Efficacy of proton-pump inhibitors in children with gastroesophageal reflux disease: a systematic review. Pediatrics 2011;127(5):925-35. HealthCare Otago. Formulation in pharmacy practice. Dunedin: HealthCare Otago, 1993. Sharma V.K, Peyton B, Spears T, et al. Oral pharmacokinetics of omeprazole and lansoprazole after single and repeated doses as intact capsules or as suspensions in sodium bicarbonate. Aliment Pharmacol Ther 2000;14:887-92.
Pegasus Health. Irritable infants - reflux and constipation GP Small Group Education. Pegasus Health, 2011. Oh S. Proton pump inhibitors. Aust Fam Phys 2011;40(9):705-8. Hassall E, Kerr W, El-Serag H. Characteristics of children receiving proton pump inhibitors continuously for up to 11 years duration. J Pediatr 2007;150(3):262-7. James L, Walson P, Lomax K, et al. Pharmacokinetics and tolerability of rabeprazole sodium in subjects aged 12 to 16 years with gastroesophageal reflux disease: an open-label single and mulitple-dose study. Clin Ther 2007;29(9):2082-92. Canani R, Roggero P, Romano C, et al. Therapy with gastric acidity inhibitors increases the risk of acute gastroenteritis and community-acquired pneumonia in children. Pediatrics 2007;117(5):e817-20. Reimer C, Sondergaard B, Hilsted L, Bytzer P. Proton-pump inhibitor therapy induces acid-related symptoms in healthy volunteers after withdrawal of therapy. Gastroenterology 2009;137:80-7. Merwat S, Spechler S. Might the use of acid-suppressive medications predispose to the development of eosinophilic esophagitis? Am J Gastroenterol 2009;104:1897-902. Tighe M, Afzal N, Bevan A, Beattie M. Current pharmacological management of gastro-esophageal reflux in children. Pediatr Drugs 2009;11(3):185-202. BMJ Group. 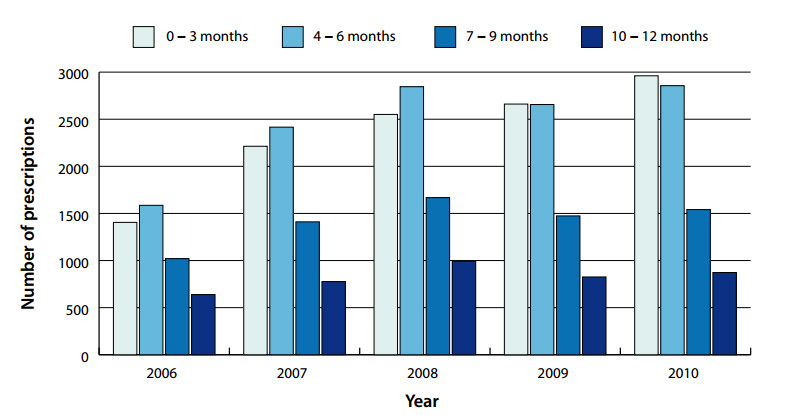 BNF for children: 2010-2011.London: BMJ Publishing Group and Royal Pharmaceutical Society of Great Britain, 2010.